Ian started his musical career at the age of eight, joining the town brass band playing the cornet and by the age of eleven had attained the title of Welsh soloist of the year. He played in the Gwent County Youth Band progressing to principal cornet. Ian also enjoyed singing in many musical productions and always took an active part in the field of music. During 1976 he joined the Tredegar Town Band and in 1979 became the band's principal cornet player, moving on to the world famous Cory Band in the Rhondda which won the British championship for three consecutive years. In 1991 Ian joined the choir as a singing member. His knowledge and enthusiasm was soon recognised and in 1993 he was appointed Musical Director. Helen is an accompanist of considerable experience and versatility. She has accompanied many accomplished artistes at home and abroad, several amateur operatic societies and numerous male choirs that include Llantrisant, Bargoed, Ebbw Vale and Tredegar. 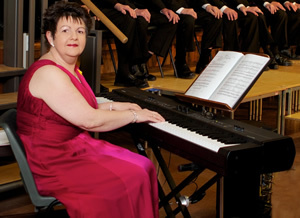 Helen has been closely associated with Tredegar Orpheus Male Voice Choir for many years having held the position for eleven years during the 1990's and into the millennium. Helen's second appointment to the choir came earlier this year.